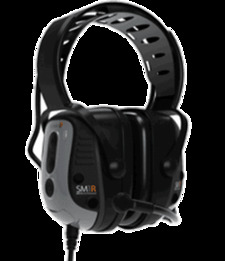 Sensear SmartMuff SM1R Communications Headsets let you communicate face to face in high noise environments up to 95 db without the need to remove the muffs. Sensear SM1R headsets also let you plug into your existing two way radio for clear communications in noise environments up to 110 dB. And, because SM1R headsets are powered by your two-way radio, there are no batteries in the headset to recharge or fail just when you need them. No batteries also means the headsets are lighter weight for a more comfortable all-day fit. SM1R IS Intrinsically Safe Headset Certified to some of the most stringent intrinsic safety standards: TIA-4950-A, CSA C22.2 No.157.92, & UL 913 5th Edition with a hazardous location rating of Class I, II, III, Division 1 & 2, Groups A - G, T5, -25°C to +60°C.